I met Tess Masters in the elevator of my hotel during Vida Vegan Con in Portland, Oregon, in 2013. I was feeling jet lagged from the time difference and exhausted from the conference, and I’m sure my weariness showed. I wanted to get back to my room so I could take a nap before dinner. Tess, on the other hand, was a bundle of energy. With a genuine smile on her face, she shook my hand and introduced herself, and I had one of those “I’ll have what she’s having” moments. 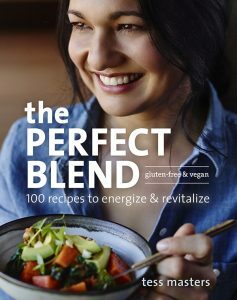 Thankfully, Tess has made it easy for us to have what she’s having with her new cookbook The Perfect Blend: 100 Blender Recipes to Energize and Revitalize. When most people think of preparing food in their blender, they think of smoothies, but Tess proves that there’s so much more to blending than just drinks. The recipes in The Perfect Blend do include beverages, but there are also soups, snacks, salads, sides, main dishes, and desserts. We’re talking about recipes like Lick-Your-Plate Lasagna, Mind-Blowing Moroccan Pizza, Nosh-On-‘Em Nachos, and Life-Changing Chocolate Pudding. The book’s 12 chapters are broken down into health goals, such as Energy, Immunity, Detox, Protein, Weight Loss, and Anti-Inflammatory. Each recipe includes optional boosters, so you can tailor the recipe to your own taste. The Perfect Blend is not just a cookbook, it’s also a nutrition guide. Tess shares information about the health benefits of what she calls “hero foods”, so you’ll have a better understanding of why she uses the ingredients she’s included in each recipe. There’s even a handy chart that shows the benefits of the different hero foods. She also includes tips for blending to create different textures and tasting, making incorporating healthful fruits and vegetables into your diet both fun and delicious. While most nutrition books can come across as stuffy, The Perfect Blend is fun and inviting. It’s full of gorgeous photos, and Tess’s energy shines throughout the book. This book is a must have for anyone who wants to incorporate more healthful meals into their daily routine. Roasted garlic and a touch of curry pull the classic potato-and-leek combo up to a new level. Resist the urge to overcommit to curry, because this soup sings when it’s subtle. (The turmeric boost will up color, flavor, and anti-inflammatory ammo.) 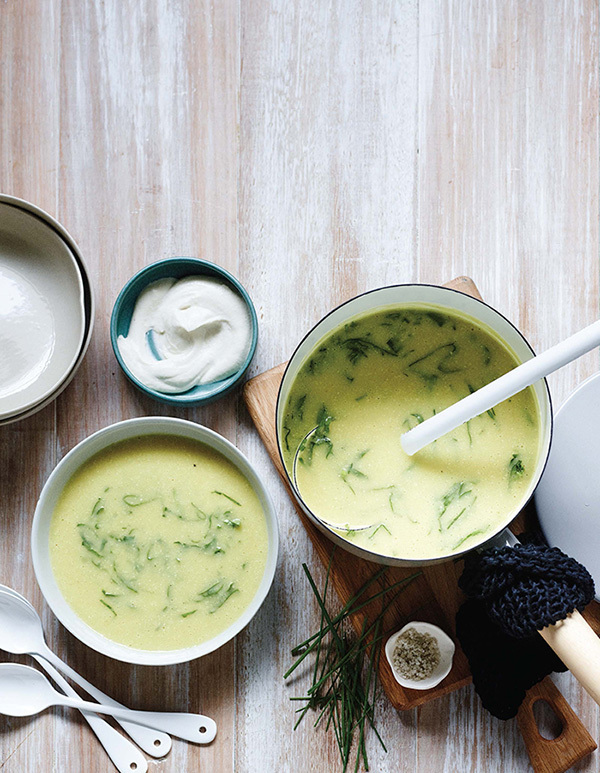 Lemon juice brightens the blend, a dollop of sour cream adds a beautiful tang and creaminess, and chives chime in with bite. Depending on the character of your potatoes, stir in more sour cream, and for a richer texture go with that drizzle of olive oil. For crunch, top with the crushed cashews. Remove the papery outer layers from the head of garlic, leaving it whole, with all cloves connected. Trim 1⁄4 inch (6mm) off the top of the head to expose the cloves. Drizzle with the 1 teaspoon of olive oil. Wrap the head in parchment paper, then in aluminum foil (to allow the garlic to steam and not burn, and to reduce aluminum transfer), and roast for 40 to 60 minutes, until tender. Allow to cool, then squeeze the garlic pulp out of the skins and set aside. You should have 2 to 3 tablespoons of roasted garlic. Rinse the diced potatoes to wash off some of the starch. In a large saucepan, heat the remaining 2 tablespoons of olive oil over medium heat and sauté the leeks and celery with 1⁄4 teaspoon of salt for about 5 minutes, until soft and translucent. Add the potatoes, the cauliflower, roasted garlic pulp, and 7 cups (1.65 l) of the vegetable broth. Increase the heat to high and bring just to a boil. Reduce the heat to medium-low and simmer for 10 to 15 minutes, until the potato and cauliflower are just tender. Immediately remove the saucepan from the heat (to reduce the starch build-up) and allow the soup to cool slightly; stir in the curry powder, the turmeric boosters, and cashews, and allow to cool for a few more minutes. 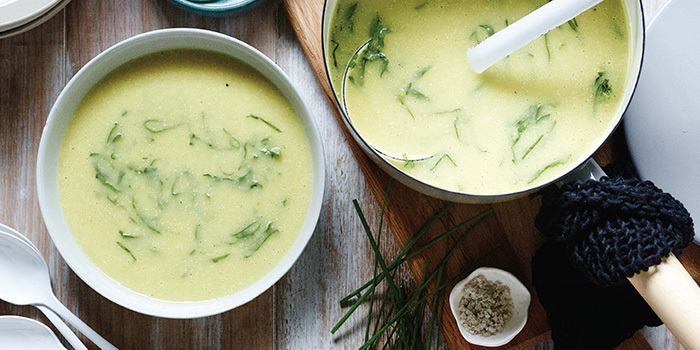 Working in batches, pour the soup into your blender with the remaining vegetable broth and puree on high for 30 to 60 seconds, until smooth and creamy. (For conventional blenders, remove the small center lid cap and cover the opening with a kitchen towel so steam can escape while you blend.) Return the soup to the saucepan and warm it over low heat. Stir in the lemon juice and the remaining 1⁄2 teaspoon salt, then tweak the lemon juice and salt to taste. Stir in the spinach for 30 seconds just to wilt it. Ladle the soup into bowls and swirl 1 teaspoon of sour cream through each serving. Garnish each bowl with 1⁄4 teaspoon of the olive oil booster, a sprinkle of the cashew booster, and 1⁄4 teaspoon of the chives. Pass additional sour cream, lemon juice, and olive oil along with the remaining chives at the table. Reprinted with permission from The Perfect Blend, copyright 2016 Tess Masters. Published by Ten Speed Press, an imprint of Penguin Random House LLC. Because I slather gobs of this on just about anything, I had to put myself in handcuffs so I wouldn’t work it into every recipe. For a creamy texture, you just gotta soak those cashews. Chill the cream in the fridge for a few hours, preferably overnight, so the flavors mesh and the blend thickens. Boost with cauliflower to ramp up nutrition, and with onion powder and chives for a magical middle note. It keeps in the fridge for about 5 days, but never lasts that long. Pour the water, lime juice, and apple cider vinegar into the blender. Then add the cashews, mustard, garlic, salt, and the cauliflower and onion powder boosters. Blast on high for about 1 minute, until smooth and creamy. You may have to stop the machine periodically and scrape down the sides of the container. Tweak the lime juice, vinegar, and salt to taste. Stir in the chive booster. Transfer to a container and chill in the fridge for a few hours to thicken.